This past June BlueHour made it out to Yellowstone National Park for a 5-day scouting trip. We're hoping to be able to run a photo tour to Yellowstone & Grand Teton in 2019, or the coming years. Yellowstone has a lot to offer, from active geysers and hot springs to wildlife in every corner. 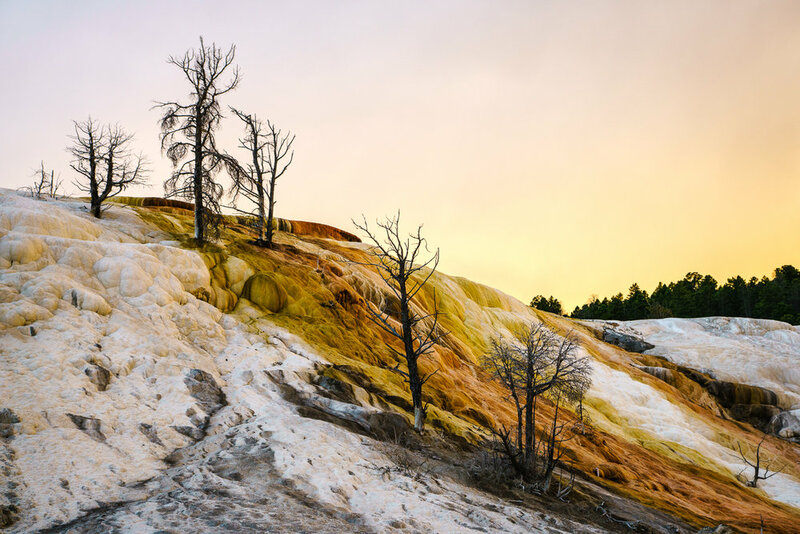 Touching three states, Yellowstone is America's first national park, and includes terrain of every kind: mountains, lakes, geothermal features, and canyons and waterfalls. It is one of the most varied landscapes we've ever shot, and its right in America's backyard. This is a shot of Castle Geyser by moonlight, just feet away from the better-known Old Faithful Geyser, which erupts very predictably, all day long. Castle Geyser erupts about once per day, and can be predicted to an accuracy of within 2 hours. If you ask us, Castle Geyser was 1000x more interesting than Old Faithful. It erupted for a full half an hour, while Old Faithful lasted about 5-8 minutes maximum. Old Faithful is also extremely crowded. We're always amazed at what garners the masses and what doesn't. Surely, Castle Geyser deserves a larger audience! Here are some shots from our sunrise shoot at Fountain Paint Pots. Not a soul around, except for us two photographers and a lone bison warming up by the springs. The dead trees that stick out of the mineral-rich ground and thermal areas make for some intriguing compositions. Here are four of our favorites. We also make video of every place we go. The Lower Falls of the Grand Canyon of the Yellowstone was prime for a zoom. Did you know that underneath Yellowstone is the world's largest Supervolcano? It can be a little scary to read about, but amazing all the same. The magma chamber underneath is 37 miles long and 18 miles wide. The previous eruptions were large and violent and covered much of the United States states in ash - they even made some species extinct and changed world weather patterns. To top that off, we're overdue for another one. Due to this volcano, Yellowstone is one of the greatest and most dense geothermal areas on Earth, and is home to at least 1,283 geysers, and over 10,000 total geothermal features. This ecosystem is certainly something to behold. Rainbow colors come from the organisms that thrive on the heat produced by the spring. The center is too hot for anything to live in, so it remains blue and lifeless. Each layer from there on out is home to a different type of organism, resulting in the different colors. The organisms create "bacterial mats" which can make for some good abstract photography. Another tourist-favorite is Grand Prismatic Spring, Yellowstone's largest spring, which is only properly seen from the air. Nevertheless, it's photo-worthy. If you're far away enough, you might be able to catch the colors being refracted through the rising steam. Yellowstone geysers are usually covered in a thick layer of steam as the hot air rises and cools. You can get creative with it! If the sun is shining in the right direction, funny things will happen. The video on the right shows Paul & I's shadow shifting through the steam layers. Morning Glory Pool. In the past, this pool was a much deeper blue, but due to continued littering, the pool is becoming clogged and eventually may not be a spring at all. We hiked to Imperial Geyser, a flat hike that included Fairy Falls, and reached this view. Few venture past the paved roads in National Parks, but if you do, you'll be rewarded. This was one of the more impressive geysers we saw, constantly erupting. Gotta take a silly shot. Fairy Falls. Paul's artisan and glass-maker friend, Katie of Glass Sails, created this little marble for us to use for some environmental portraits! It's known that some of the wildlife in the parks are not all that wild. There were a number of chipmunks begging for handouts at the Falls, including this adorable one-eyed chippie that let me shake his hand. One of Paul's favorite parts of the trip was nearing the end, when we took a chance on Firehole Lake Drive. It's a lesser-traveled geyser area in park. We woke up for sunrise and were treated to some moody conditions, and long-awaited geyser eruptions. Above is Great Fountain Geyser, and below is White Dome Geyser, located on the same road. Probably one of the worst sunburns I've ever had! (And one of the most color-coordinated) These burns took a whole 3 weeks to heal. Wear sunscreen! I should just swear off of shorts altogether. A slow motion video of Old Faithful. Paul taking a cell phone video too! Here I am, photographing some bison as they cross the street. If you're ever in Yellowstone, make sure to visit the Lamar Valley for some bison herds. The Lamar Valley is home to the largest and longest free-roaming herd of American Bison in the U.S. All of the bison in the park are descended from 23 individuals, as this species was hunted to near-extinction in the 1800s by the U.S. Army. Yellowstone is responsible for rehabilitating many species, such as the bison and the gray wolf. It's a great read if you aren't familiar. Cowbirds ride the bison in a symbiotic relationship: the birds eat the insects and carry loose fur off to build nests, and the bison receives a cleaning. Babies look just like cows. The iconic shot: two bison males battling it out in front of a mountain scene. The running joke on this trip, which still has me laughing, is we would try to name the big males. These two are dubbed Kendrick Lamar (for Lamar Valley) and Mark Buffalo, courtesy of Paul's sense of humor. We hope to return to Yellowstone again soon! If you're to join us, you'll be sure to take home some amazing images of all kinds.